It seems like just yesterday that we arrived back from Shepherdstown and Harpers Ferry. I had every intention of getting some photos posted to share with all of you. It is so beautiful over in MD and the eastern panhandle of WV. DH and I went on a very long hike, high up on the red cliffs of Maryland Heights to take photos looking down on Harpers Ferry. I haven't dumped all of the photos to the pc yet, but I think there are a couple in here that I can share. You will see how muddy the Potomac River is from all of the heavy rain over there. Although it rained for some part of each day, it was either before or after the activities we had planned. 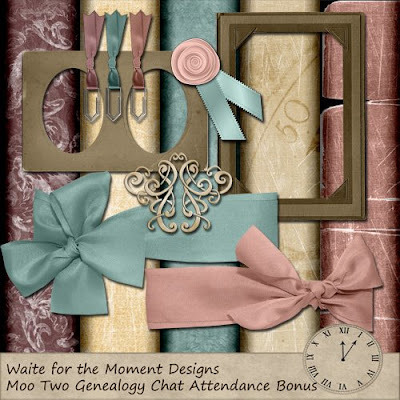 This kit will be given as an attendance bonus for the Moo Two Genealogy Chat on Thursday, June 25th at 9 p.m. Eastern time. Bring your questions with you. Everyone is great at sharing ideas and tips. DH and I are going to head off for a long weekend away from everything. I am so excited that I've packed already LOL!! The auditor finally left at the close of today!! The audit has been complete for over a week, but he had to type up all of his reports and findings :( Anyway, he has gone, we've made arrangements for the fur-baby while we are away and I can't wait until time to head out. I'm taking both cameras and hope to have tons of photos to scrap with when we get back. There is also rain in the forecast for each day and DH is really starting to worry that I will actually make him take me to the Cumberland Mall Ha Ha!! See you when we get back and don't forget to mark you calendar for the chat at Moo Two. 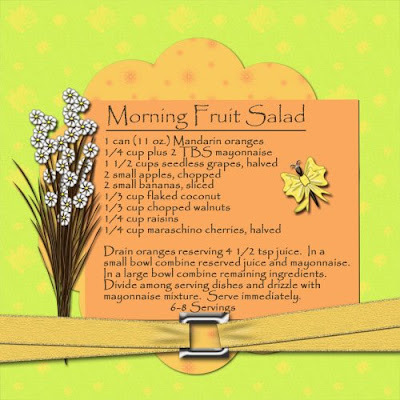 I'll be putting the new Font and Recipe Challenges up at Moo Two later this evening. 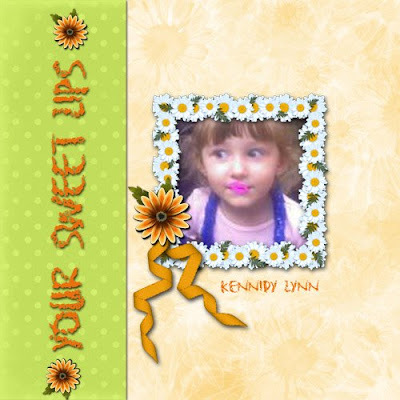 We are going to use a font called "Lipstick Traces" this month and below is a layout that I created using the posting bonus. I think it will be a fun font to work with and can't wait to see what everyone comes up with. 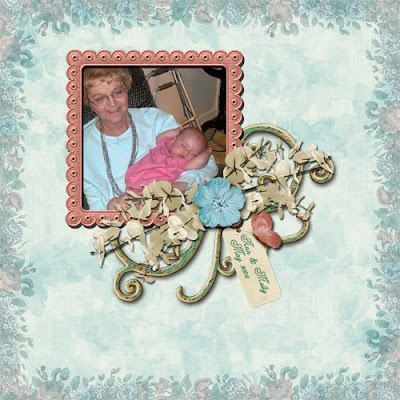 I used Friends kit by GAP Scraps (Gail P.) over at Moo Two Designs Forum. 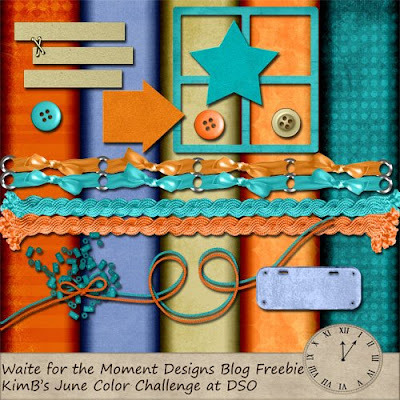 It is the kit used for Needle In The Haystack Challenge from May 15th to June 14th. Clues are posted daily in the challenge forum to help you find the pieces of the kit. Christine does a wonderful job of pointing them out - sometimes with the links right there. 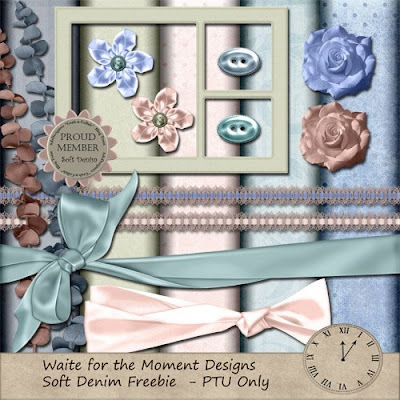 ;) The kit is not only given for this period, but the pieces remain in place for a while after the month ends. It doesn't take a lot of effort to collect them and if you miss a day (which I am terrible about doing) the link is still there. Okay, enough chatter about that. Little Molly is the daughter of my cousin. She was born prematurely and had a terrible reaction to the meds used on her mother in the delivery room. Although she had a terrible beginning and almost didn't make it, you can see she is doing well. Can you tell that is her grandma holding her?? LOL!! Be sure to hop on the train again HERE to get the rest of the pieces to this collab.